I find myself wandering more than I should over various blogs and sites looking at tyers that are more practiced and skilled than I could ever hope to be. It never ceases to amaze me the imagination and creativity some possess. 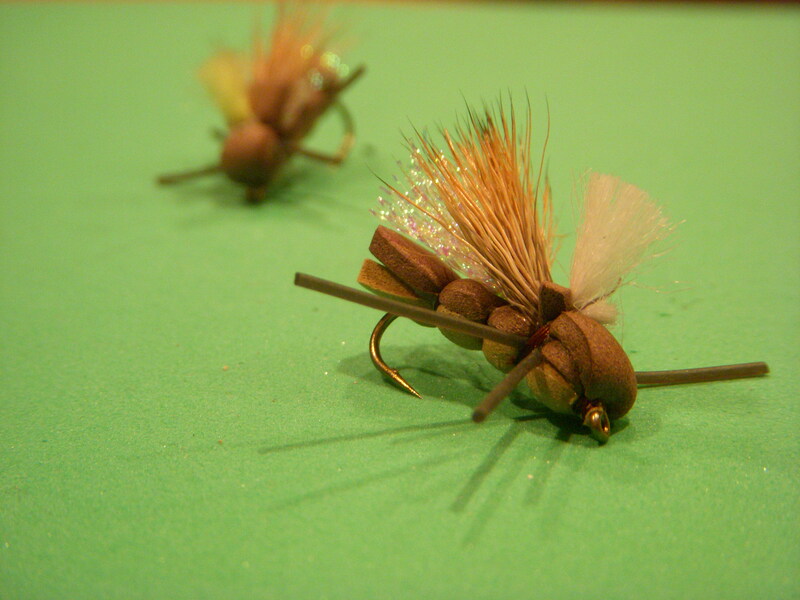 Since buying my vice and my few meager supplies, I wander frequently to one particular site in particular and I have had my eye on tying the “Hopper Juan.” I sat and tied feverishly for an hour and completed two flies that slightly resemble the original and several that will find their way to the scrap pile. Summertime will be prime time to tie this to the end of my leader and tempt a fish or two. They truly do not do the creator justice so please check out the original at the Hopper Juan. Thanks so much for posting and for following my blog. I appreciate it. Those hoppers look pretty good! You have done a good job and I can’t tell that you haven’t been tying that long. I’d eat those! Keep up the good work and I’ll try to send some people your way.